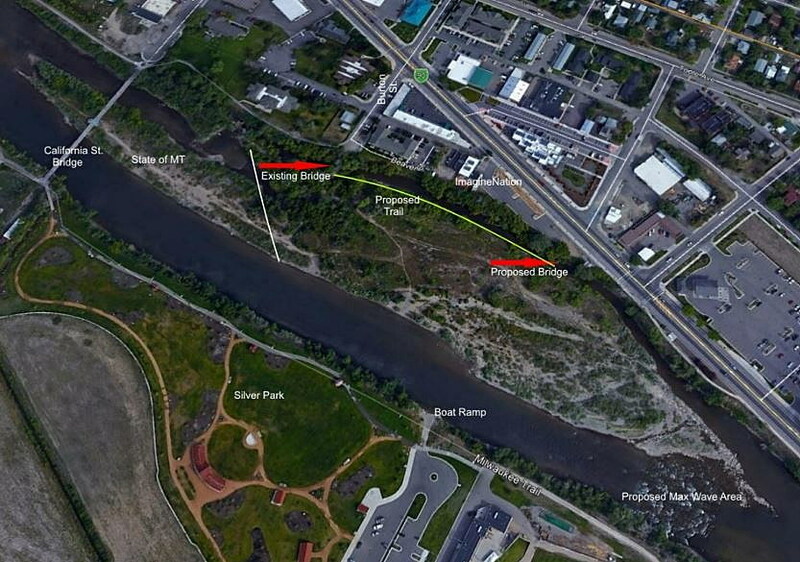 An island in the Clark Fork River just west of downtown will become the next city park, offering river rats sandy access to the waterway. On Thursday, the Missoula Redevelopment Agency’s board of directors approved a $110,000 service agreement with Morrison-Maierle to complete the project’s final design, including a bridge to access the island and the necessary trail work and parking. All in, the project is expected to cost as much as $500,000, though costs could come in lower once work begins. The city will manage the island as conservation and open space rather than as a developed park. Two bridges will access the island, each connected by a trail along the island’s northern perimeter. Design of the project is now five years in the making, though it was envisioned decades ago in an urban renewal plan. But much of the island sits in the annual floodplain, and all of it lies in the 100-year floodplain, complicating certain elements of the design, including bridgework. Conservation crews with Parks and Recreation have already begun removing vegetation and noxious weeds, not only to restore the island’s riparian habitat, but to disrupt the island’s use by transients by eliminating hiding spots. Over the past three years, Behan said, the island has seen a steady increase in drug use and criminal activity associated with transients. Conservation crews have encountered hazardous materials, including medical waste, he said. Restoring the island to public use and opening up the vegetation is expected to help resolve the problem. Caras Park faced a similar challenge before it was redeveloped many years ago. While the city looks to open the island for public use, a separate but related project dubbed Max Wave continues to creep forward. That project, similar to Brennan’s Wave in downtown Missoula, is proposed for the island’s eastern tip, just across from the boat launch at Silver Park. Buchanan said changes made by the Montana Department of Natural Resources and Conservation no longer allow a nonprofit to apply for projects in a river. That has to come from local government, the city of Missoula in this case. The city has not yet agreed to partner in the project, or to maintain Max Wave once it opens. MRA board members praised the project.